Krull was an interesting blend of fantasy and science fiction it had a great cast, an original premise, and some unique ideas - and very bad reviews. What went wrong? 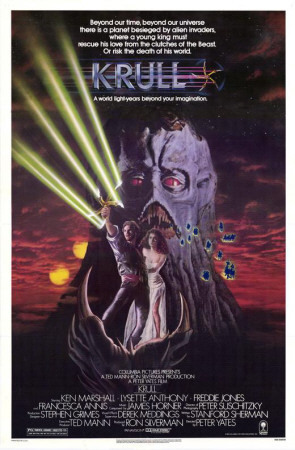 Krull was released by Columbia pictures in 1983. An interesting blend of fantasy and science fiction it was poorly received, but is notable for an unusual selection of actors (indeed face spotting is a common pastime while watching it). But with a great cast, an original premise, and some unique ideas, this film still ends up on the bad movie review. So what went wrong? The plot of Krull is very simple: Princess Lyssa has been adbucted by the Beast on the eve of her wedding to Prince Colwin and now he has to rescue her and defeat the Beast, gaining the one weapon that can defeat it. Along the way he encounters giant spiders, assassins, shapeshifters and many other fantasy cliches, but Krull does manage to put a unique spin on them. The cast is strong - aside from the two leads the supporting cast includes Robbie Coltrane, Liam Neilsen and Freddie Jones among others. The special effects are good for the time, although they have now sadly dated. This had all the ingredients for a hit fantasy film. ... And I do not travel with peasants and beggars. Goodbye!" The trailer for Krull, in wide screen. It had all the ingredients for a great fantasy movie, excellent cast, terrifying villains and some genuinely scary moments. The Widow of the Web sequence stands out even today, and some of the effects are outstanding and unique. Unfortunately it never quite gels. The fantasy movie with everything: a throneless king, a doleful wiseman, a magic weapon, a giant spider, also has spacemen with laser guns. The bad guys: Slayers, who bear an odd resemblence to stormtroopers and their twisted master. Huge chuinks of backstory - present in the novelisation - are missing from the movie, meaning that characterisation suffers and motives can be incomprehensible. In some ways Krull can't decide what it wants to be. Is it an apocalyptic struggle against an overwhelming enemy, a lighthearted fantasy, a grimdark horror or an action adventure? The film spans all of these at times and as a result doesn't really excel at any. The effects are too horrific for children - the daytime version is severely cut - but the plot is too simple to hold adult attention. On the other hand, as enjoyable kitsch fantasy it excels. Critically panned, it has become something of a cult classic often listed on the "So bad it's good" levels. As a fan of somewhat bad films, I have to say I have always had a soft spot for this movie - I just can't pretend it's a good film. because the author had time to delve into the backstory of the world which proves to be rich, detailed and unique. because the author is noted writer Allen Dean Foster, author of Alien among many many others. More commonly available from Amazon.co.uk than.com, its cheap price more than makes up for the shipping and currency conversion. "There are kingly virtues other than bravery. Courtesy is one of them." One of the pleasures of Krull is star-spotting. This is very close to a who's-who of up and coming British actors of the time, and a few established stars. It is interesting to spot them, see who went on to greater things and who didn't, and watch major film stars get killed off in ways studios can't afford to today. Bernard Bresslaw - from Carry On to Krull? All heroes have magic weapons, and Krull is no exception. In this case it is a five-pointed throwing weapon, called the Glaive. Sadly, despite looking genuinely cool, it is one of the most mocked fantasy weapons of all time. A Glaive is a large bladed pole-arm weapon in the European tradition, much like a Japanese Naginata but with a heavier blade. The weapon extends blades from the tip of each spine, which means it is difficult to hold and throw. He uses it about twice in the whole film. The hero has telekinetic control of it, which reduces the problems with 2, but the first time it extends blades while he is holding it, I winced. In some recent fantasy games and movies, the term glaive is misapplied to thrown weapons. This film is the reason why, so if you want to see where the problem started, watch Krull. and it was a very critical reception. Third party reviews at the time were scathing. Even now they aren't exactly kind. However the cult reviewers tend to love it, for its unique qualities, ideas that have never been replicated (perhaps for good reason) and unusual production values. TVtropes.org offers an excellent break down of Krull, both the good and the bad. However it also offers a lot of spoilers, so if you don't want to spoil a kitsch classic, avoid this entry. On second thoughts better read it - if you still want to watch it after reading this entry, at least you know what you ae getting into, and may well enjoy it. My personal view? 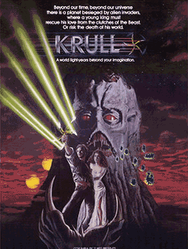 Krull is only considered a bad film because they hadn't made Dungeons and Dragons yet. Directed by Peter Yates. With Ken Marshall, Lysette Anthony, Freddie Jones, Francesca Annis. Audience opinions on Krull - Did you like Krull or not?